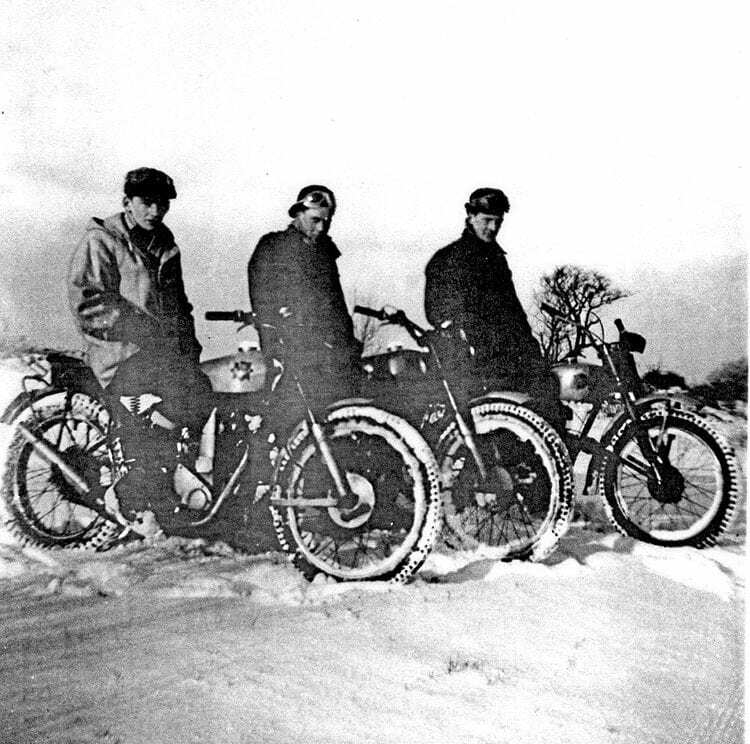 It’s that time of year when motorcycling magazines feature snow scenes from yesterday, so here’s one from 1953 that was taken on the Cleveland Hills in Yorkshire. From the left, it shows Peter Martin on a very desirable Goldie, John Hewitt on Rex Young’s works 500T Norton and myself on the only brand new bike I ever owned, a 197cc Dot TDHX. Peter was very fortunate as he had the use of a 350cc Douglas for summer riding as well as the BSA for winter trials (there was no mud-plugging in summer in those days). Both bikes belonged to an elderly neighbour who could no longer ride them. It makes your teeth chatter just to look at it! This wintry scene of 65 years ago shows the writer (right) with his pals Peter Martin and John Hewitt. John worked for Rex Young, who at the time owned Dickenson’s motorcycle shop in Middlesbrough. It never ceases to amaze me that Rex seems to be largely forgotten in the current motorcycle magazines. In the early 1950s he was the best sand racer in Europe, as well as being the only British ISDT rider never to concede a penalty point. He held the highest points per start at Pendine, won numerous national trials as well as being a works Norton and BSA teamster and much more besides. For my part, I suffered the Dot for only one year. It was terrible, with its three-speed gearbox, 4W5 in rear tyre and insufficient front wheel clearance from the mudguard. What was really needed was a James Commando! I rode a three-fifty Matchless for the 1954 and subsequent seasons, but never had another two-stroke until about 2000. Great days! Previous Post:Pullover, tie and brown polished shoes!